This course has a high didactic structure to prepare a student as a complete teacher. A lot of information about the real history of yoga, philosophy, especially tantrism, and anthropology to learn how was born yoga, what was, what is actually. A deep study of anatomy with 3D software to learn how is the best way to perform and research an asana without injury. Psychological, emotional and postural study of Chakras. Outdoor experience in nature to learn in the best way what is meditation and how to meditate using your breathing. The course will be in the famous and wonderful Sorrento Coast. A unique place in the world, famous since ancient times, with the sea view of the Gulf of Naples with Vesuvius volcano, the island of Procida, Capri, Ischia, Procida. Villa Gallone is a historical and luxury Villa with Mediterranean garden with a jacuzzi. The distance from the archeological Roman site of Bagni della Regina Giovanna directly on the sea is 15/20 minutes by feet. The distance from Sorrento city center is 15 minutes by feet. A perfect location to enjoy your training and spent your free time. Villa Gallone is a historical and luxury Villa with Mediterranean garden with a jacuzzi. The distance from the archeological Roman site of Bagni della Regina Giovanna directly on the sea is 15/20 minutes by feet. The distance from Sorrento city center is 15 minutes by feet. A perfect location to enjoy your training and spent your free time. Among lemon trees, local tradition furniture and collections of books and encyclopedias, Villa Gallone is the ideal place to spend a high-level Sorrentine stay. The former residence of the director Carmine Gallone, the rooms exude memory and inspiration; located in the residential area of the city and surrounded by a lush Mediterranean garden, the villa will surely make your holiday a special memory. Recently renovated, the villa offers a selection of typical furnishings belonging to the Sorrento tradition. The spacious living area, the spacious kitchen, and the bedrooms combine luxurious comfort with the elegance of historic minimalist design. The Mediterranean garden that surrounds the house acts as a diaphragm between the interior spaces and the street and is the perfect place to take a walk or enjoy an outdoor drink. This course has an high didactic structure to prepare a student as a complete Teacher. A lot of information about real history of yoga, philosophy, especially tantrism, and antrophology to learn how was born yoga, what was, what is actually. 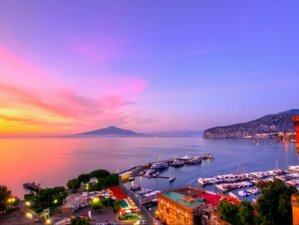 The course will be in the famous and wonderful Sorrento Coast. A unique place in the world, famous since ancient times, with the sea view of the Gulf of Naples with Vesuvius volcano, the island of Procida, Capri, Ischia, Procida. The buffet breakfast includes scrambled eggs, croissants and sweet and savory baked goods, biscuits, slices biscuits, cereals, milk, coffee, cappuccino, tea, fruit juice, mineral water, and fresh fruit of the season. From Naples. All the specific details and information about how to get there will be available after the registration to the training. Zoe Animal Yoga offers adventure, wellness, nature, and yoga retreats in exclusive locations in Italy, led by yoga master, Enrico De Luca (E-RYT 500 - RYS 200).